Dr. Seung-yun Kim is an Assistant Professor of Department of Electrical and Computer Engineering, and First Year Program Coordinator of School of Engineering at The College of New Jersey, Ewing, NJ. 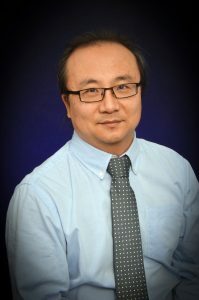 Dr. Kim earned a Ph.D. and master’s degree in electrical engineering at the University of Dayton and a bachelor’s degree in electrical engineering from the Saint Louis University. His research interests include collaborative computing, human-centered systems, mobile and ubiquitous computing, and intelligent robotics, and he has been awarded about $500,000 in grants. He has published about 40 refereed journal and proceedings, and serves as a reviewer for the NSF and several technical journals and conferences. He has extensive experience in outreach to K-12 programs, promoting STEM education.